State Rep. Sean Shaw, the Democratic nominee for attorney general, began the general-election campaign with a nearly $500,000 financial advantage over his Republican opponent, Ashley Moody. But don’t expect Moody, who depleted her cash in a grueling primary, to struggle to catch up. Moody’s campaign, for example, last week announced a Sept. 18 fundraiser at the Governors Club in Tallahassee. The invitation suggests a minimum contribution $3,000 for the event, which includes as co-chairs Brian Ballard, a Republican lobbyist and fundraiser who has close ties to President Donald Trump and Gov. Rick Scott; former U.S. Sen. George LeMieux; and lobbyist Michael Corcoran, brother of outgoing House Speaker Richard Corcoran. Moody, a former Hillsborough County circuit judge, burned through her campaign funds in the final weeks before the Aug. 28 Republican primary against state Rep. Frank White of Pensacola, according to numbers posted on the state Division of Elections website. Between Aug. 11 and the primary, Moody’s campaign and the political committee Friends of Ashley Moody spent about $1.57 million, mostly on advertising. Moody ended up topping White by 13 percentage points in the GOP primary. Through his campaign and a political committee, White spent $5.8 million on the contest, including $3.97 million from his own pocket and that of his family’s Sansing auto-dealership chain. Overall, Moody spent about $4.6 million on the campaign out of her two accounts. The committee Friends of Ashley Moody had about $25,000 in cash on hand as of Aug. 31, while her campaign account had about $29,000. That also does not include what the state classifies as “other” distributions, which may include credit-card purchases. Between Aug. 11 and Aug. 24, Moody sent $1.23 million to Maryland-based Mentzer Media Services for advertising. Mentzer Media received $745,000 from Moody’s campaign account and $493,800 from Friends of Ashley Moody. Overall, Moody spent $3.07 million on advertising through Mentzer Media. 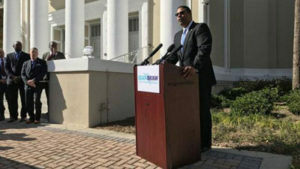 Meanwhile, Shaw had about $470,000 in cash on hand in his campaign ccount and nearly $78,000 in the political committee Sean Shaw for Florida, according to his most-recent filings. The campaign account number is as of Aug. 31, while the committee number is as of Friday. Those totals do not include what are classified as “other” distributions. Recent campaign filings show Shaw, of Tampa, also spent $26,990 in legal fees in August. His campaign was initially successful in a lawsuit that sought to decertify Democratic primary opponent Ryan Torrens as a candidate because of an improper qualifying-fee check. A stay by the 1st District Court of Appeal allowed votes to be counted in the contest, where Shaw prevailed by 47 percentage points. Jeff Siskind, an attorney from Wellington running as an unaffiliated candidate, has spent all but $6.44 of the $7,620 he’s raised or loaned to the campaign. Moody, Shaw and Siskind are running in the Nov. 6 election to replace Republican Attorney General Pam Bondi, who faces term limits.